If you’re looking for a really simple, incredibly tasty appetizer that’s perfect for fall…THIS. IS. IT. 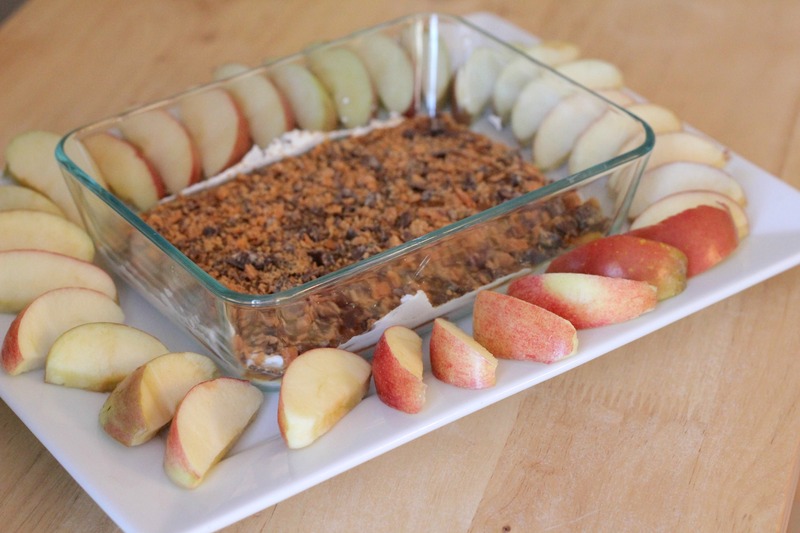 Everyone knows that apples and caramel are a classic fall flavor. Plus, everyone likes the combination of apples and caramel, don’t they? I’ve certainly never known anyone to turn it down. I loved everything about this dish. First, I loved how easy it was to put together. It only involves 4 ingredients, and it’s as simple as spreading them in a serving dish. Second, I loved how this tastes! The candy on top just adds the perfect crunchiness and the flavors all work so well together. This is great for any fall get-together. We ate them today with a friend who came over to watch football with us. Sadly, my Auburn Tigers are having one of the worst seasons in decades. Delicious treats like this help alleviate the pain of losing. Mix the cream cheese and brown sugar together well. Spread evenly into the bottom of a shallow dish (~8 x 10″) or pie plate. Pour the caramel sauce over top and gently spread it out evenly. Feel free to add more or less caramel, depending on your tastes. Top with candy pieces. Cover and refrigerate until consumption. Serve with sliced apples. I must try this! Yum! Yes! It’s so easy there’s almost no excuse not to make it! Me too! It’s one thing to be a delicious dip…but to be so delicious and so easy is almost a miracle.